Living Values For GOD, For Your Fellow Man And The Dignity Of The Human Spirit. The market has been quite interesting in the last one month, mostly bearish than bullish. The insurance sector which has been a darling of most investors is gradually becoming a terrain where one has to be careful and circumspect in treading. 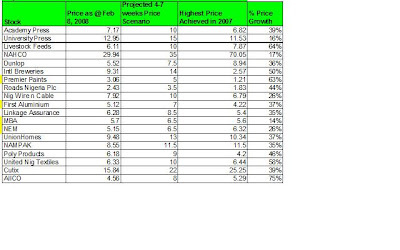 The table above shows how we performed based on the stock pick basket suggested earlier in February. No doubt individual performance will be based on what period of the month Purchase and sale was made. Most of the stocks in the basket have gone through a period of highs with a fair number falling back to their price at our February 8 post date; in fact some have actually fallen below the prices of those date. however, during the course of the month, most of the stocks reaching their highs surpassed our projected price range. I hope we were able to take advantage of the projections and more importantly as I am learning by the day, imbibing the discipline of knowing when to sell (ofcourse this advice is only for those playing short term. Medium term to long term players have nothing much to worry about). Personally, my choice from the stock pick basket gave mixed returns. My best performer was First Aluminium, while Linkage Assurance gave me negative returns. I have recovered slightly from my intial losses in UNTL and Nigerian Wire and Cable. I am still optimistic that these stocks hold great potential in the short to medium term and look forward to bullish tendencies in the next 1 month. The greatest challenge I had during the period was my broker's inability to make my purchase when I tell them, I actually lost significant value based on my orders being executed a week or two after initial orders were placed. It was quite frustrating, though not entirely the broker's fault, but I was tempted to change them during the month. I will be posting a more robust list for our March/April basket in the next few days. Tracking your Nigerian Stocks...a tool you can use! I practically "sneaked" back to the office to write and make this post. I couldn't go another week without a post...I was sure to be on a guilt trip during the easter holidays...over one month since my last post...gosh! What was I doing? Well I have been busy of some sort with plenty of fun many times in-between. The highlight for me was winning a bronze medal in the team squash competition of the Nigerian Oil and Gas games held in Abuja last month. I was severely trounced by many opponents, but being able to win a bronze medal was down to members of my team and just goes to show that sometimes in life, all you need to win is to just "participate"... at least your name will be on the roll call! Before I delve into my picks for the month of March/April ( can you believe March is over already?) in a separate post, let me use this post to introduce you to a tool I came across last month that has really brought sanity to the way I now track my stocks. Prior to discovering this tool, I had this very simple excel sheet I developed for my use with the tedious task of following stock prices and updating them manually. It was quite effective and I had used it for the past 3-4 years. Up to a point, I was hoping I could make it available to readers of this blog. But now there is no need for my excel sheet anymore! I now use a very user friendly tool on http://www.investordelight.com/. This site provides a tool that you can use to enter all the shares/stocks you have. You can provide all the details that includes: when you bought them, the name of your broker, the charges you'll incur when you buy and sell, and also providing you on a daily basis your stock performance. The site automatically updates with the latest stock prices upon conclusion of a trading session at the stock exchange. If you so choose, you can receive a mail on a daily basis on how your stocks are performing showing price and percentage gains. I was quite excited about the tool because it perfectly mirrors my excel sheet, but more importantly provides a lot more (even when I sell, the tool allows me to make the necessary deductions!). I give a lot of kudos to the developers of the tool. I recommend you use this site and reduce the worries on how to track your stock performance. With some very simple steps after registering on the site, you are good to go...and for your information, it is free! so visit http://www.investordelight.com/ today and enjoy! I'm yet to figure out how to load a table on my blog, and dont yet have a server you can access to download tables from. You can download the Jpeg image above (hopefully, the picture quality will be helpful). It presents a basket of stocks you can play with and some of my possible price scenarios. The last column shows the possible percentage price growth for our target period (we could do much better, or a little less!). I hope you find it useful. We will track our performance in another month from now (approximately on the 10th of March). Cheers! On friday, I instructed my broker to sell some units of my GTB, Presco, UTC, Livestock Feeds and First Aluminium. The entire proceeds from these sales would be used in purchasing AIICO. I called late friday afternoon, but couldn't get any detail on these transactions. I have to say, it's quite hard giving the order to reduce my GTB and Presco holdings. When we talk about fundamentals being right, these companies are near the top of the pack. The future of both companies is definitely in the "black" from the short to medium term. But my current "market" behaviour is strictly driven by my goals and objectives! I am keen to play short term trades for this year as I believe the potentials are definitely huge. In another 3-5 years my strategy may be entirely different, and God willing I'll discuss this future plan with you. So why did I sell UTC and Livestock Feeds? I'm I anticipating a fall in their prices or do I think they have gotten to their peak already? The answer is NO! I believe these stocks are still rising and may continue for some time to come. Selling these stocks for me was a big test. Before I bought these stocks I had a threshold selling target. This is a very important lesson we all have to learn when we choose the short term trading route. You need to set your taget and try and resist the temptation to hold for much longer than expected. I expected a 30-40% gain in these stocks over a month period. Livestock has done 46% while UTC has returned 77% (initially falling by -5% in 2-3 days) over the one month target. I just had to sell these stocks to be true to myself (it doesn't matter to me if tomorrow they do over 500% return). Also, I have to say, what made the decision to sell now quite easy is the fact that my unit holdings were not so huge. So it was a perfect opportunity to test if I am only driven by money or by the overaching principle of goal setting. The next big test for me is if I can give an order to sell Equity Assurance(as at Friday, it has returned over 99% in a month!). I think I will give the order....i think! So what about First Aluminium? Why sell some units of a stock you bought a few days before? Well, I bought some units early in January and this has returned 65%. I thought it necessary to sell some of these units. I still anticipate more price appreciation of this stock and thats why I still hold significant units of the stock. So I have asked for AIICO...yes I did. This stock should easily do 40-50% in another month. Amongst many reasons, there is a huge demand for Insurance stock out there, and it just seems there is not enought to go round! Furthermore, AIICO did a public offer late last year, the price for this offer was an unbelievable steal(@N2.20 or something close...)! Ofcourse, I did not buy the public offer, because I'm losing patience with the certificate or no certificate drama, I'll rather pay premium on the secondary market and know I can take full ownership of my purchase in less than a week. Wishing you a lovely week ahead...enjoy! NB: Does anyone know how to insert a table here or create a link for people to b eable to download a table I have created listing possible stock picks for the week/month...if you have any ideas, please let me know. Linkage Assurance and First Aluminium - Would You? I have been targeting NEM insurance and Premier Paints for over two weeks now. Everytime my broker returns unsuccessful. It has been quite frustrating monitoring these stocks from the very first time I placed the orders and see the price rising and yet couldn't find any to purchase. Its a classic case of losing "phantom" money. Anyway, I gave up chasing on these stocks and made a new order yesterday(Feb 5). I requested for Linkage Assurance and ordered for more units of First Aluminium. Fortunately, my broker came back successful. The interesting thing about First Aluminium for me is that I have not seen their financials or made any detailed analysis of the company's stock. My decision to buy this stock(at least in the short term) is largely informed by a discussion I had with a colleague of mine in the gas supply business who had an opportunity to relate with the comapny sometime in the not too distant past. In the course of our five mins discussion, I was able to pick up "healthy" comments about the relationships and plans of the company. The final comment I heard that triggered my buy decision was that the business of Aluminium was profitable but the problem is....ofcourse...POWER! well, thats not new, even in my house, I have that problem, does it then mean I have weak fundamentals...LOL! I am hoping somehow, I will be able to lay my hands on the financial reports of First Aluminium and then take my time to digest and analyse, but in the short term, my reading of market sentiments(which is somettimes more important than financial performance for short-term trading) favours an upward swing in the stock. we might experience some fits within the next week or two, but largely, I think the stock can make a 20-30% appreciation in the next 2-3 weeks...pray and hope I'm right! For Linkage, well, I have been tracking that stock for a while now, and should say the price is not as low as when i started tracking it in January; though the option I chose over Linkage then was Equity Assurance which I bought. in the next ranking order was NEM, which as I mentioned earlier, I could not get. So Linkage came in thrid place. I anticipate more price appreciation of this stock at least enough to meet my short term growth projections. If I will recommend another stock I wish to buy, I will say AIICO. I believe the price is very right at the moment(already moved from N3.43 to N4.15 i just 2 days?) and I anticipate it will race to over N6-N7 in another week or two. I'm not just sure how easy it will be to get in the market now. One of the things I chose to do this year is to try and stop using just my “head” and begin to use the ‘pen”. This made me write down increased activity on the stock market as one of my objective for this year. I don’t intend to be sentimentally attached to any stock this year (I actually wrote it down…and also I need a wallet too…). Well, not to say I have been docile before now, but I was rather conservative in my approach. I always picked good stock, carefully analysing the value (seen and unseen) of a stock before making my choices. The choices always turn out right. But this year I chose to do something different, and my interim plan is to have it this way for another 3-5 years before revisiting my strategy again. On many occasions in the past, I was never disturbed by volatility in the market (even though in most cases, it has been upward volatility for me). I buy a stock for medium to long term reasons. Whatever happens to the price of a stock, I just won’t sell a stock because I try to come in when the price is relatively low. However, upon review of last year’s performance, I didn’t do too badly (an average of 50% over my entire portfolio), but also found out missed opportunities. With the same money, I could have gotten far more returns if only I had adjusted my strategy a bit. I needed to make my “blood” flow faster than it does currently. I needed to hound my broker a lot more to buy and sell like a “proper” trader would. So I commenced active trading in January this year, and the results have been quite impressive. I made a choice between income stocks and growth stocks. Some of the stocks I held were in the long term growth stocks but in the short to medium term were income stocks. Some other stocks I figured out were growth stocks both in the short to long term, but there is a caveat, they could be quite risky. I will be targeting only growth stocks for this year. I acted immediately on this strategy commencing in the 2nd week of January. First thing I did was to sell my Nigerian Breweries and Union Bank shares. I had the Union Bank for over twelve months, while the Nigerian Breweries, I guess for over a year and a half, maybe even 2 years. Don’t get me wrong, I got decent returns on these stocks, but I considered I could do much more. So what did I buy? I went for Livestock Feeds and UTC. I considered these stocks to be appropriately priced and believed they could appreciate by at least 30-40% in a month’s time. Do you want to know the results? Two weeks after, Livestock had returned 43% while UTC clocked 40% returns by the last day of January (UTC initially returned -5% after 3 days before picking again). Confessions: I am yet to offload these stocks as I planned, but will definitely do so shortly (one thing I have prayed for is to have the discipline to sell when my set objective is met and take the next “big” decision. A week after I sold the Nigerian Breweries and Union Bank, I took another bold step. I sold some units of UBA, GTB, Unilever, and my beloved Presco shares (and all my Crusader Shares). I instructed my broker to use the entire proceeds to buy…guess? Equity Assurance! It was such a divine choice. I had no access to any fundamental analysis to make this decision, but comparing the price of the stock vis-à-vis other stocks at that time, I told myself, this will definitely be a slam dunk! In less than a week, I was over 35% in value. As at yesterday (3 weeks after), it was over 60% in value. During the same time period, I also made a purchase of First Aluminium in the 3rd week of January, and by 1st week in February, it was 36% up in value. If you think I am excited, you are damn right! I need to point out the basis of my excitement, its not the returns per se, it is the fact that I took a decision and immediately acted upon it, and the results are showing. I believe this will be the hallmark of my life this year and beyond: to make a decision, act on it and stand by it! If you noticed from above, the stocks I picked in the last one month were quite peculiar. Well, the common parlance is to call them Penny Stocks, I won’t challenge that nomenclature, but I’m not popular with that usage. I’ll rather say my plan is to go after appropriately priced stocks that I believe have 20-40% growth potential in a 20-30 day period. I have asked God for wisdom to do this with excellent results this year; I believe he will help me. Do you want to come on this journey with me? Some choices I make this year could scare you but something tells me we will have so much fun while doing this. NB: if you are interested in seeing the list of my Buy and Sold activity in January, leave a comment behind and include your email address. I am yet to figure out to load a table on this blog, and the picture quality when converted to Jpeg just didn't cut it. How time flies! Its been over three months I last made a post. so much has happenend to me in this period. I have read some life changing books, dug deep into myself preparing and writing essays and in-between, had a wonderful holiday period. I know its stale and much belated, but all the same...happy new year! I truly need to apologise to everyone who visited this site in the past months and met nothing new, it has been quite intense for me. I finally got through most of the stuff I'm involved with last friday and believe I'll be a lot more regular on this site going forward. Interestingly, while all the activities and enggagement was going on around me, I never kept far from investing. I have a new strategy (and i already got some stunning results during the month of january) and approach to investing which I wil be sharing in my next post. Should He sell his Transcorp shares? The lesson from today's post must not be missed by anyone who reads this! A very good friend of mine had a discussion with me today and his concern centered on what to do with the shares of Transcorp Plc he bought over a year ago. He is currently reappraising his performance on the stock market (I suppose he is been playing for the past2-3 years now) and and plans to jiggle a bit with his medium to long term plans. He is proud to say he has had some stupendous measure of success, however his only sore point is...yes...Transcorp! So how did he end up with Transcorp? Well, this friend of mine credits most(if not all) of his stock picks to my advice, however, on Transcorp he did not heed my advice. He was a constant torn to my ears through his phone calls asking what to buy and sell. Credit to him though, he was one of the reasons I decided to commence this blog. I remembered the period I got a call from him requesting what my opinion was on Transcorp, he had some money(a little below N2m) and was considering putting it in Transcorp. What was my consideration then? Well, I have to confess, I was not damn right prescriptive to him then, but I was equally quick to put a caveat on Transcorp shares. Needless to say, I had a discouraging tone towards Transcorp for anyone with a short to medium term perspective. Don't get me wrong, I am quick to admit that the idea and concept Transcorp represents is noble. The sectors targeted for investment were indeed strategic (and still are) and do hold great potentials. What about the people behind the Transcorp idea, well, I don't know any of them personally, but truly they are people of worth and credible experience worth banking on. So what was wrong? Why didn't I jump on the bandwagon? Why did I choose to use body language rather than my harsh voice to put a "no-no" on the stock back then? In one of my flaneur moments, shared with my friends during both the private placements and eventual IPO of Transcorp, I was quite categorical on the inappropriateness of taking a dive with Transcorp for anyone with "meagre" capital. I remember picking up the prospectus of Transcorp back then, and was puzzled to discover no historical performance to base any meaningful economic evaluation on. I asked for specific "Economic Value Creation" activities the company has had good track record with, and behold there was none. My mantra then became, if you invest in Transcorp, you invest in an idea - a good idea, but "unproven"! What Transcorp needed then was not a "public offer", it needed "Venture Capital". It was not a 50-50 chance for great returns in the short run, it was a near 90-10 chance of loss of economic value. Furthermore, compounding my puzzled mind then, was also the lack of a clear strategic plan by the proponents of the idea, it was clearly missing in the prospectus. That was another red flag! So I'm I completely writing off Transcorp? Not at all, I'm only asserting what is now obvious - don't expect any magnificent returns in the short to medium term (actually, the price is quite low now, so it might actually not be a bad idea to buy, but my caveat still stands!). If Transcorp puts its house in order and comes out with a clear plan to ride the crest of economic potentials Nigeria offers, it is a sensible long term bet! It will take a lot of patience(with a 1000 heart skips and beats to go with it) to reap benefits from the stock. So what will I advise my friend? Stay in for the long haul or get out? It's hard (He invested at a price of N6 and the stock now goes for about N3), he is going to halve the value of his money from near N2m to less than a million. Tough...but the decision has to be taken...I wish I could just tell him, leave it there and hopefully 10 years from now, you can use the returns to pay your children's school fees, but he has a short to medium term plan for his funds and needs to rescue what he has left. Indeed, he should sell....do you think differently? So if he sells, where can he put this money in the short term that will possibly make-up for the loss he has made on Transcorp? Truth be told? I'm at a loss...but with a gun to my head as I think with my fingers..I'll do an Insurance company or take a position in Presco Plc, at least they have past performances I can review! I will take another time off investment talk today and a bare a little thought for our consideration. It was a huge (though simple for most people) decision I had to take if I was to travel to Ghana by air or road. Two natures I have dominant in me were truly at contest. I hate unnecessary stress, and road travel through two different West-African countries onward was a guaranteed bet to provide lots of stress. But, I love travelling and seeing places. I love to peer into the eyes of the ordinary people because I know their silence rhythms out the answer to a long sought bliss. The quietness of their struggles flames my vision for a future filled with possibilities. With an online booking already in place and the desire to avoid stress, it took the other nature of me…curiosity to sway my decision to go by road with other members of the team put together from my country to attend this 1st African Youth conference in Accra, Ghana. Moreover this will be my first time to travel to a fellow West African country, so why not start with a quick skim-through of the country side. When some decisions are made, you must be prepared for some trade-offs. I got a full dose of “African Hospitality” unfortunately the “un-Proper” Naija way! I (we) have never witnessed such attention to unnecessary detail as witnessed exiting my country. Our custom men apparently have had some FBI or CIA type training and they were willing to snoop everything on you…how best will you explain asking to scan through my memory card because I took a picture of a curious looking “okada-type” tricycle. Unfortunately for the entire team, I wasn’t the only guilty party. By the time the drilling and over 3 hours grilling was through, the steam was out of most of us by the time we crossed into no-man’s land between Naija and Republique du Benin. Though we were quickly attended to in our fellow brother’s country, we were treated like spies by our fellow country-men….so much passion for a nation seeking for true identity! I have always shared the opinion that to further the possibility of African renaissance, we need a sense of urgency on how integration is achieved in the continent. Don’t get me wrong, I’m not asking for (mediocre-thought) amalgamation of Africa, just some simple basic things that will ensure seamless mobility across the entire landscape of the continent…for the real people of the continent. Apparently, I observed(please tell me I’m wrong, cos I really could be) that travel options within the continent for the so-called poor and lower end of the various countries, those who will be readily considered to use ground travel is much more difficult and burdensome when compared to air-travel within the subcontinent. My little submission here: another dimension to consider in solving the multi-faceted poverty problem in the continent is to address so much unseen opportunites such cumbersome structures deny us. My point? Across the length and breadth of the continent, the faces of ordinary people seek for interaction with other ordinary people, and the more this interaction can be facilitated through simple infrastructure, flexible customs procedures and willing government de-bottlenecking, the better our chances for creating extra-ordninary possibilities. Japaul, Fidelity Bank and International Breweries Public Offers - Dilemma? It seems to be another mild season of raising additional investment capital out there now. With Fidelity Bank, Japaul Maritime, International Breweries Ilesa(IBI) engaging prospective investors with their public offers. Dangote Flour IPO just closed about this week, I hope you got yours, if not you can still parley your broker to slot you in as compilation is being done at the moment. They have like another 2 weeks to submit the various applications to the issuing houses party to the offer. I wont classify any of these stocks (Fidelity, Japaul and IBI) as hot, so I understand the rather subdued tone with which they are all approaching the market right now. In fact they appear to be the least hyped public offers in the capital market as far as I can remember in the last 2-3 years. I suppose that's ok considering they are not raising capital up to the the size of Togo's GDP as various banks have attempted to in the past (just kidding!) . so the question then is: should they be ignored? As much as I share the lack of enthusiasm surrounding these offers ( I particularly shilly-shally when it comes to IPOs or POs), I will not particularly be quick to wave them all off as complete no good! Agreed they are not the best "chicks" in town...but sometimes we need to realise that gold doesn't always come as yellow. I have been beset by people I hold dearly to partake of Fidelity Bank shares and my immediate reaction was to tell them: "not interested". Don't get me wrong, its not a complete no-no, I just can't invest in every company listed on the exchange and in the immediate term Fidelity doesn't fit into my plans. I took the time to study the abridged prospectus of the bank today, the things I saw did not particularly sway me and most likely my initial position hasn't changed (unless of course my loved ones insists!). The intended use of the proceeds and the gestation period for the possible impact of the funds and management's expectation makes me look elsewhere to realise my medium to long term objectives. While the forecast for the PAT, EPS and DPS over the next 3 years are quite mouth watering, reading through the prospectus I fail to see any key strategic plan to be put in place by the management that will help achieve these targets (I know they owe me no explanation, especially with 80% of the offer already underwritten by the issuing houses...full subscription is a definite!). What I found further intriguing is that 11% of the offer will be invested in subsidiaries which the prospectus describes their contribution to the PAT as "insignificant" (3.74% as at 2006). However I will not totally rule out the possibility of some sort of capital gains in the stock in the short to medium term, but this will not necessarily be attributed to "great" fundamentals...it wont be the first time things like that happen on the stock market! On IBI, the truth be told, I have looked for the prospectus and just can't lay my hands on it. So I have no fundamental basis for placing a judgement on the stock, my basic instinct will say keep away. However, I will spare IBI just a little more thought...just a little thought. Some German investors bought into the company lately and committed some capital to turning the place around. I am also aware that the company holds significant market share (recently a report from the company claimed it cant meet the demand for its product...that is some healthy news!) in the Osun state region and its particularly adored in its area of operation. While all that is sentimental information and really shouldn't decide where you put your money, the clincher for me is the offer price. At less than N1 (not sure now, but I think N0.81k), you almost cant get it wrong. I think it holds some great prospect for growth in the medium to long term. In any case there hasn't been much growth prospect in the Brewery sector lately (largely an income sector growth dominated by dividend payments from Guiness Plc and Nigerian Breweries Plc), so it might not be bad to take a position with this "unknown" stock. My plan is to sell off some of my Nigerian Breweries stock which has become rather sluggish (and dividends quite pitiful!) in the past 12-18 months and take a "quick and dirty" ride with IBI. Japaul, without gainsaying looks the most attractive of the current POs. The price looks right(at 50% discount to its current price on the stock exchange), almost a steal! Japaul strolls its terrain without much indigenous competition and the current government's local content initiative in the domestic oil and gas industry is bound to smear a favorable aroma on the operations of the company in the future. I consider the proposed utilisation of the offer as strategic in nature while judging the stated threats and weaknesses as largely surmountable. Japaul holds great potential as a growth stock...and I intend to take to take some stake in it. One conclusion I have come to about these stocks is that they all hold strong potentials in the medium to long term, I will be visibly impressed if any of them provides any sensational short term excitement. The market has been tepid lately, and more and more investors are asking vital questions from custodians of their capital. We are definitely far from market sophistication and the potential for stupendous capital gains in the Nigerian stock exchange has been called to court lately, but the overall picture looks bright...the potential undeniable...the opportunities, still limitless.